HVAC instruments are required to measure the pressure and temperature of various sections of an air conditioning system. Typical pressure gauges are Vacuum Gauges, High Pressure Gauges and Compound Gauges. Clamp-on ammeter voltmeter is another useful device to troubleshoot the electrical circuit of an air conditioner. Thermometers with temperature range that are suitable for the location to be measured such as suction line, liquid line or air discharge temperature are basic tools that technicians should have. The advancement of digital technology has enabled many digital gauges to be produced with better precision. These measurements can be plotted on a graph, stored or feed into the computers as data for analysis. Pressure gauges are one of the most important HVAC instruments. The typical ones use Bourdon tube as the operating element. It is made from copper alloy metal and link to the pointer through gears and a linkage mechanism. When the pressure is applied, the Bourdon tube will straighten and pulling the link that is connected to it. The gear will turn anti-clockwise and move the pointer needle to indicate the reading of the pressure. 2 1/2" dial type is the commonly used with a 1/8" male pipe thread to be connected to the HVAC system. If you are looking for a pressure gauge that can measure both high and low pressure, consider using a gauge manifold. This type is usually used by the field technicians when servicing the evaporator or condensing unit of the air conditioner. The colour code of the low-side hoses used is BLUE and the high side is RED. The low-side reading can range from 0 to 99.9 psi and the high-side from 0 to 999 psi. 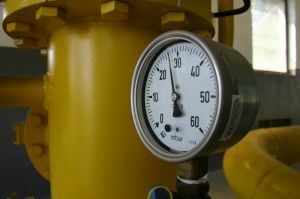 The three most popular gauges are High Pressure Gauges, Vacuum Gauges and Compound Gauges. High Pressure Gauges with scale range from 0 to 500 psi is used to measure the high-pressure side of the refrigerating system. Hence it is important that you know the typical pressure of the point that you are measuring. If you have the budget, you may want to purchase digital gauges with LCD displays. Digital readings are straight forward compared to the analog type. Vacuum Gauges measure pressures that are lower than the atmospheric pressure. McLeod gauge is used to measure high vacuums in mm Hg with typical range from 150 torr to 1 millitorr. A mercury barometer is usually used in refrigeration works. Compound Gauges are used to measure the pressure and vacuum with typical pressure range from 0 to 240psi and vacuum range from 0 to 30" Hg. Thermometers are used to measure the temperature of the liquid line, suction line, discharge air temperature and other points of interest in the refrigerating system. Glass-stem thermometers with mercury inside the tube are the most commonly used thermometers. Celcius and Fahrenheit scales are available with temperature range from -40°F to 210°F or -40°C to 100°C. These days, digital type thermometers with LCD (Liquid Crystal Display) couple with thermocouple probes are commonly use. The measurements can be change from °C to °F by the pressing of a button. Higher end type can be connected to a computer that saves the data in a hard disk for analysis. The temperature measured can be logged over a period of time and is usually used in the test lab or on site trouble-shooting. The other type is infra-red thermometer similar to the ones that the doctors use in the clinic except that the range is broader. It works by measuring the thermal radiation emitted from the object under measurement. It is useful in cases where direct contact with the liquid or solid in not possible. This is a useful instrument that can be used to measure the alternating current of a conductor without having to disconnect the circuit and connect an ammeter in series with it. By simply identifying a conductor with its insulator and clamping it with this instrument, you can get a reliable and quick reading of the current that is flowing in the circuit. This device follows the principle of a transformer where the magnetic field that is induced in the conductor is used to determine the current that is flowing in the conductor. This device can also be used to measure the terminal voltages of the circuit. You will need to set the scales of the current and voltages to be measured. Typical range of current is from 10A AC to 1,000A AC and voltage range from 175V AC to 700V AC.